I’m doing a giveaway! That’s right, I am going to give my stuff away for TOTALLY FREE. If you wan some art prints, listen up! 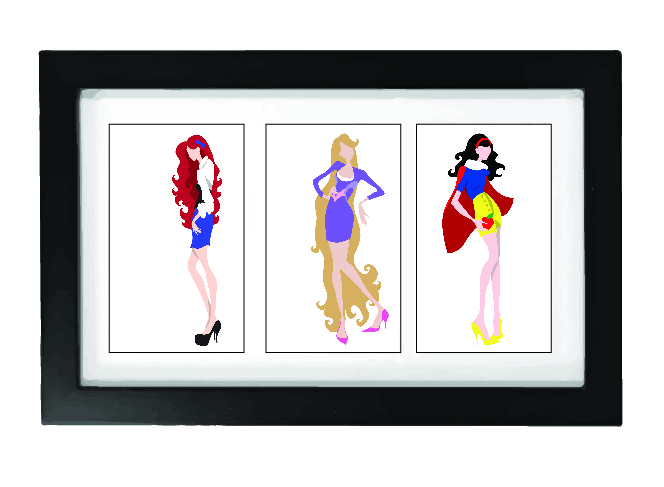 3 4×6 Princess Prints (The photo has a frame, but the giveaway is just prints) Signed by the artist, me. I will ship them to you at no cost to you. I can only ship to the US though. Here is the best part: you can choose which 3 princesses you want if you are the winner and I’ll send you the signed prints! 1. Follow my blog for new stuff! No WordPress? No problem. Go to my website’s home page and scroll to the bottom where you can sign up for updates via email! 3. Send me a link to barkeramberj@gmail.com (with subject line “March Giveaway”) of your social networking post or a screenshot of your share! Do these three things and you’ll be automatically entered! I’ll pick a winner in one week (March 20, 2013) and I will notify the winner via email, as well as announce here on my website. Easy Peasy, right? So get to sharing and I’ll get to giving!